I found a couple of filets on sale when I went veggie shopping for salsa, so we had those for dinner tonight. 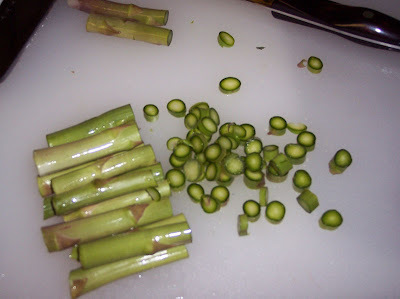 I usually cut the asparagus bottoms off, but you can do the snap method too. They are expensive, so I like to get my moneys worth by slicing a little more off the bottom parts to put into omelets or stir fry! Heat the cast iron pan on high and cook! 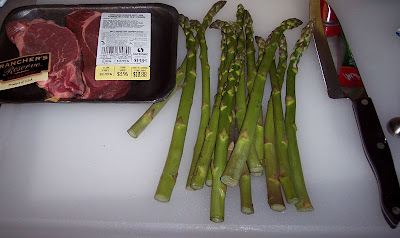 I like to get my asparagus a little blackened so I put the spears inbetween the raised bars (mine isn't the flat kind) for more surface area. Once they were done I put the steaks on, 5-6 minutes a side for medium rare on high heat (the cast iron stays smoking hot forever) they were super thick so maybe closer to 6-7 mins a side. What are you saying? IT LOOKS LIKE POOP??? That is too funny! 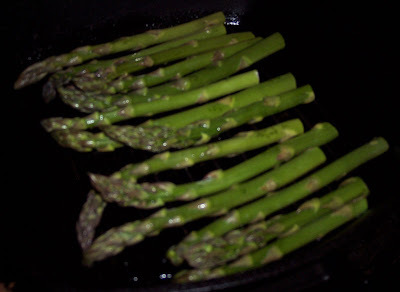 Love asparagus. Now is a great time to get it. 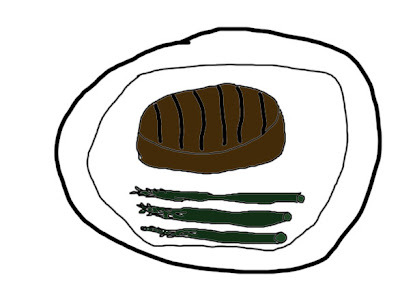 Love steak also. I don't own a cast iron pan. I know they are the best for holding the heat.